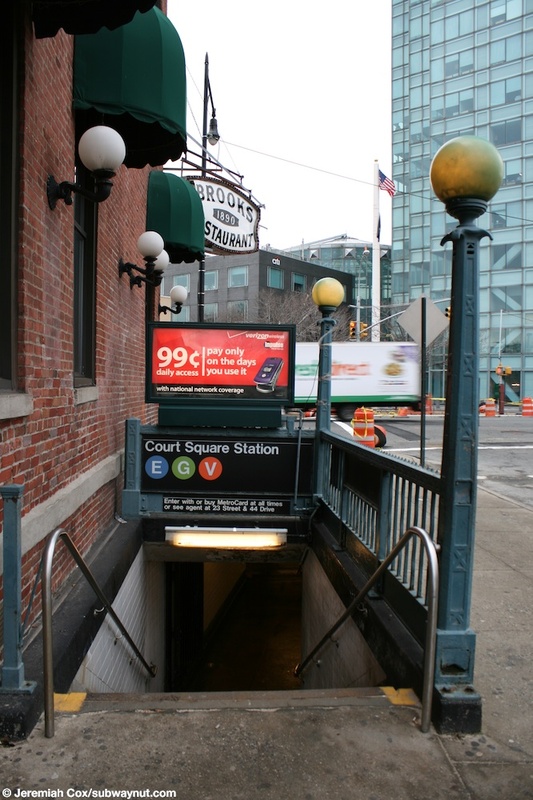 Court Square is the current terminus of the G train at all times. 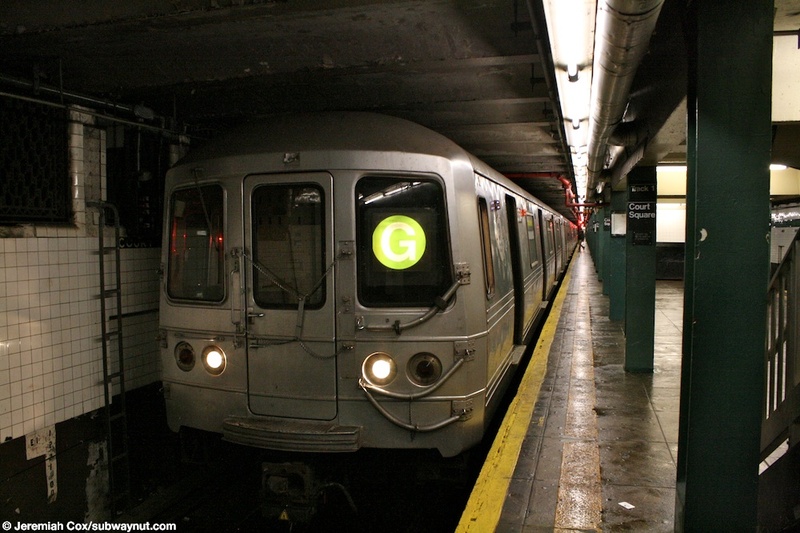 Until 2001 G trains were extended to 71-Continental Avenues during rush hours and middays. 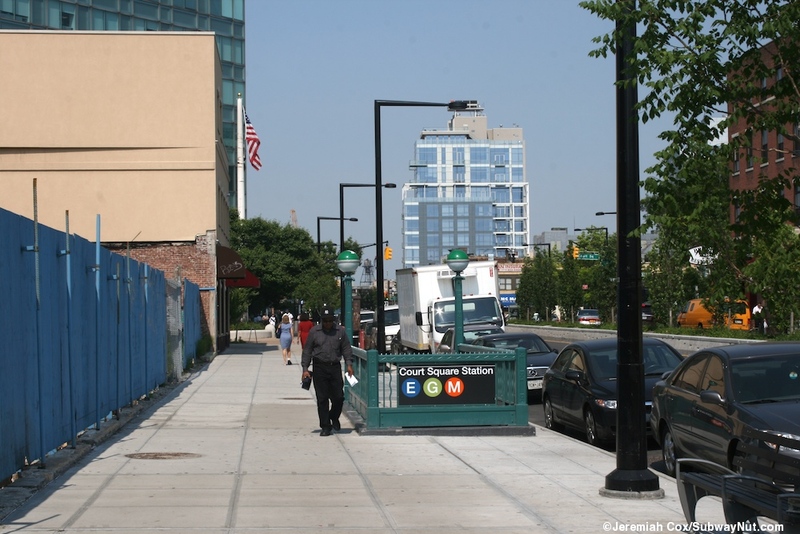 When the 63 Street Connector opened in 2001 G train service down Queens Blvd was flipped with trains extended during weekday evenings, nights, and weekends. This was a bit of a ghost service because most weekends track work on the Queens Blvd line forces back to terminate at Court Square anyway so service was in reality only extended really during weekday evenings and nights. 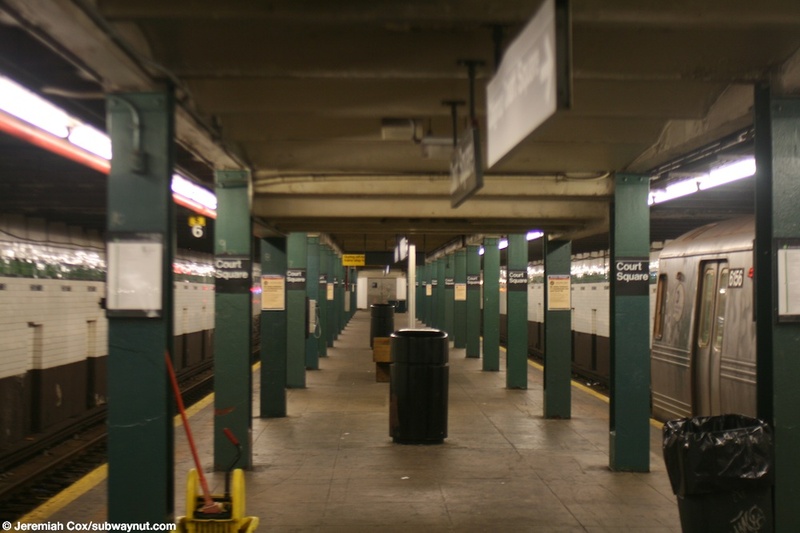 The service cuts of 2010 brought the G train's extension officially off the books and it now terminates at Court Square at all times. 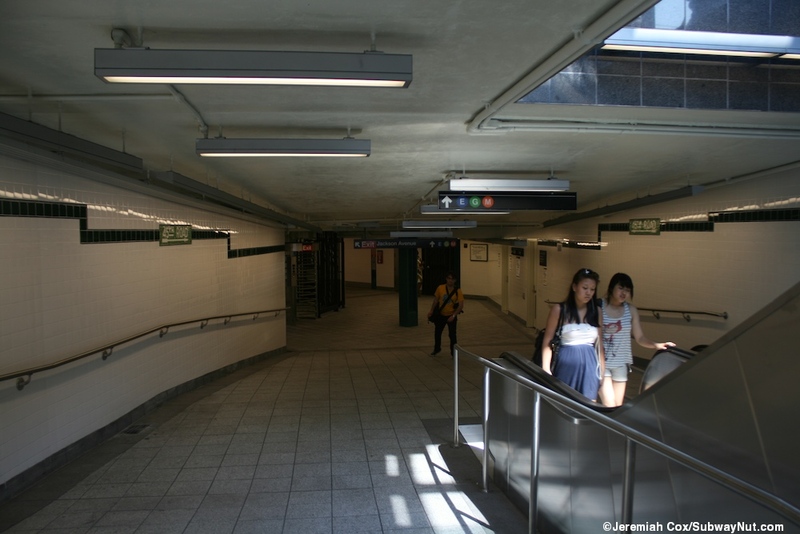 With the 63 Street connector opening in 2001 the MTA insituted a free MetroCard Transfer to the 7 train station elevated directly above the G trian station. 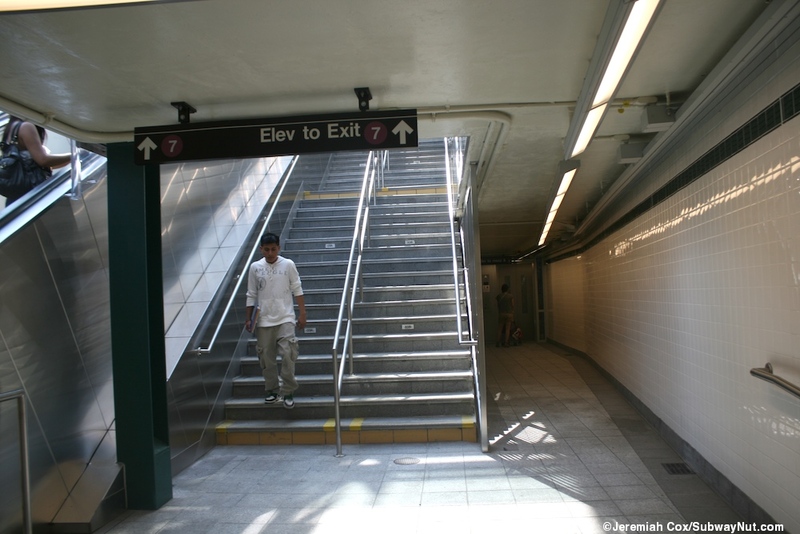 In June 2011, an in system transfer was completed with new glass escalator/elevator and staircase up through the sidewalk from the G train's underground mezzanine up to the above ground 7 trains mezzanine. The station itself is well suited to be a terminal with a single island platform and full length mezzanine area above. The island platform has a green trimline with Court Square wirtten beneath it. 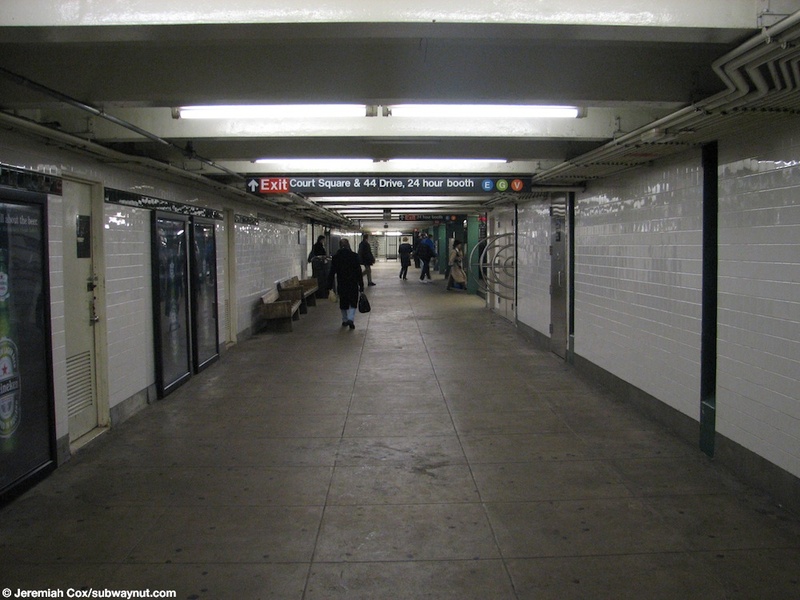 In the middle of the mezzanine is the passageway beneath the Citigroupbuilding, 1 Court Square that built a connection to the E and M trains at 23 Street-Ely Avenue that opened around 1990. 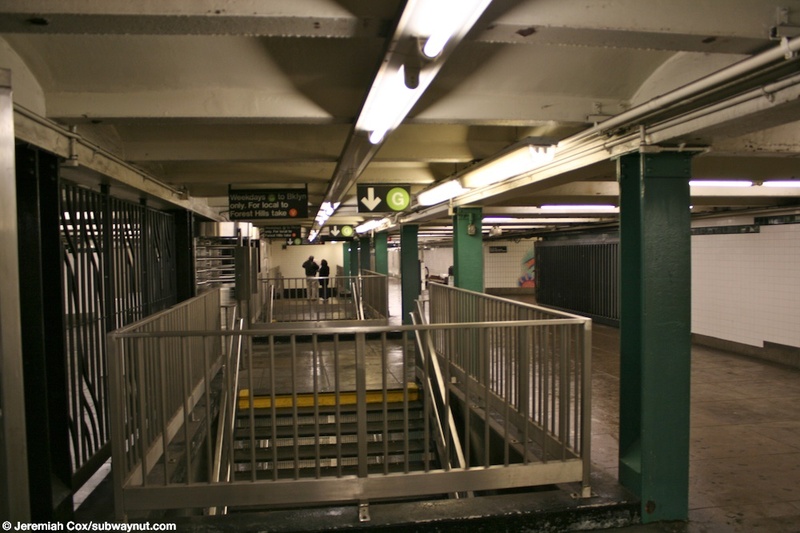 At the southern end of the platform is the new transfer to the 7 train via escalators, a staircase and an elevator (this elevator doesn't lead to an accessible transfer, the G train lacks a platform elevator. These are inside a modern, glass enclosure through the sidewalk. 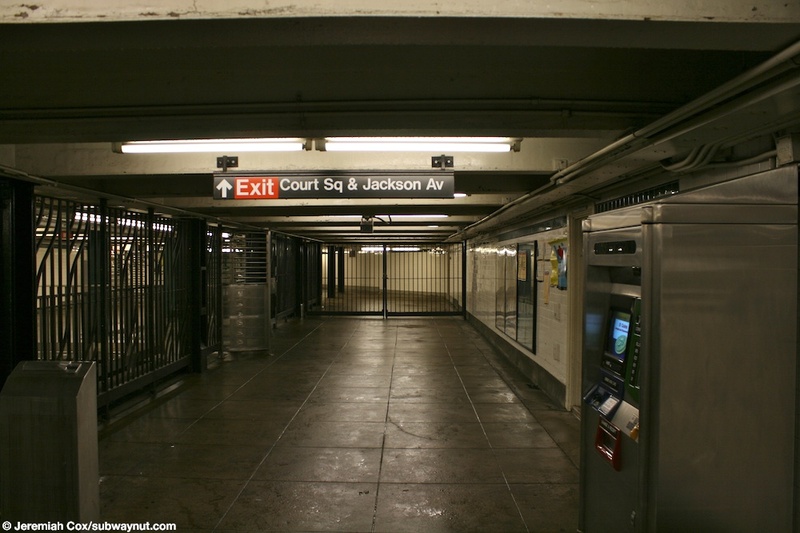 A Two high exit turnstiles lead out to a single normal streetstair next to the modern glass transfer along Jackson Avenue just west of 23 Street across from 45th Roads. 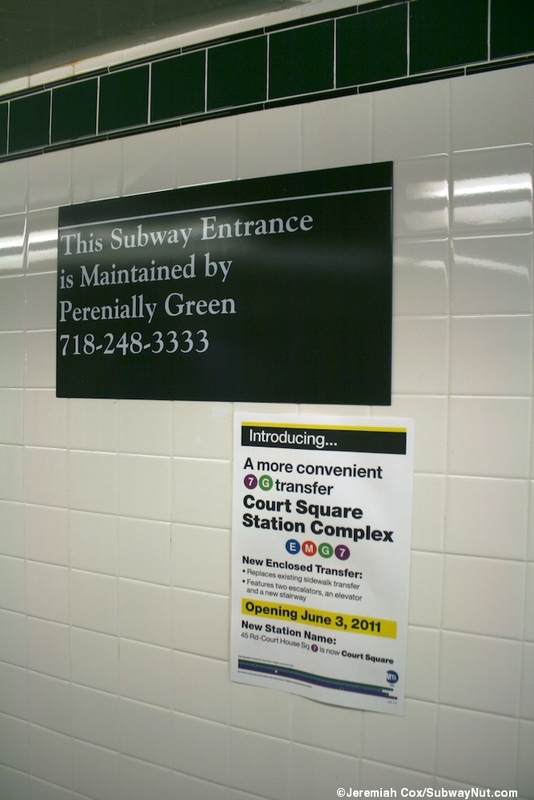 This exit was closed for the installation of the new transfer to the 7 train from January 2009 to 2011. 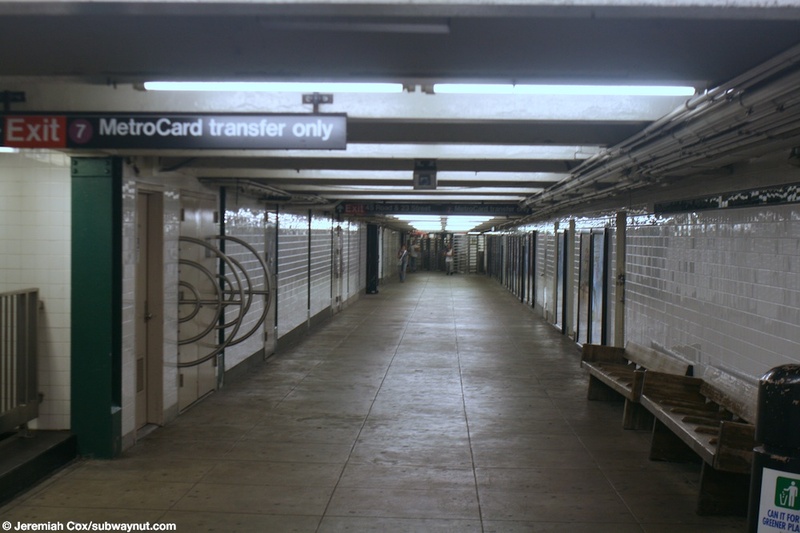 This required walking passengers using the MetroCard transfer to walk an extra block. 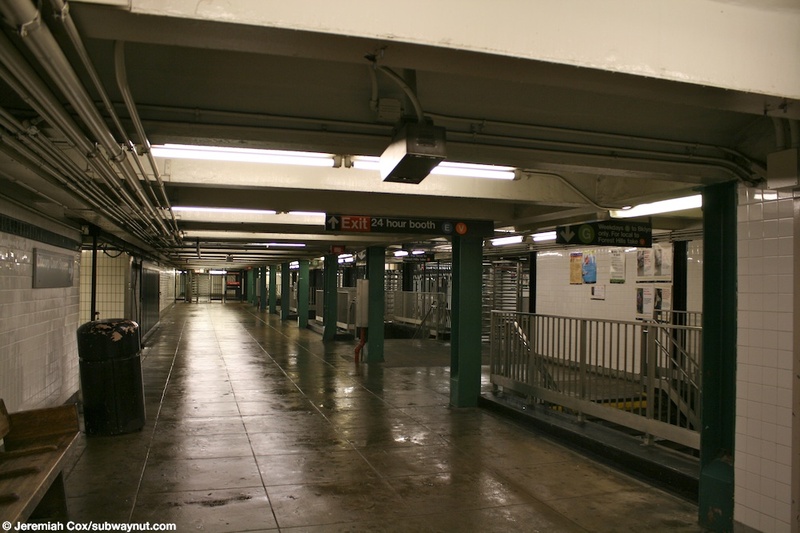 At the opposite end of the platform and mezzanine is a larger fare control area with only high entrance/exit equipment this leads out to two street stairs. One is a modern staircase with a glass back in the plaza in front of 1 Court Square. This entrance until 2010 was closed on nights and weekends. On the opposite side of the street (a bit farther down the block) is a conventional streetstair up to the SE corner of Court Square and Jackson Avenue. Looking down the narrow Crosstown Line mezzanine at Court Square. Another view down the narrow mezzanine at Court Square. Looking down towards some high exit turnstiles from the mezzanine area at Court Square . 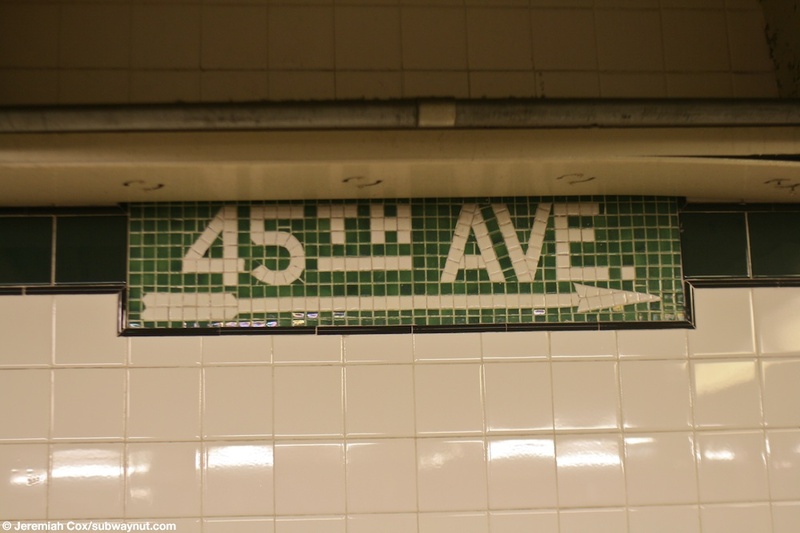 A mosaic exit sign for 45th Ave on the mezzanine at Court Square. The Court Sq below the green trim lines in the platform walls there. The back of a R46 G train stopped at Court Square. 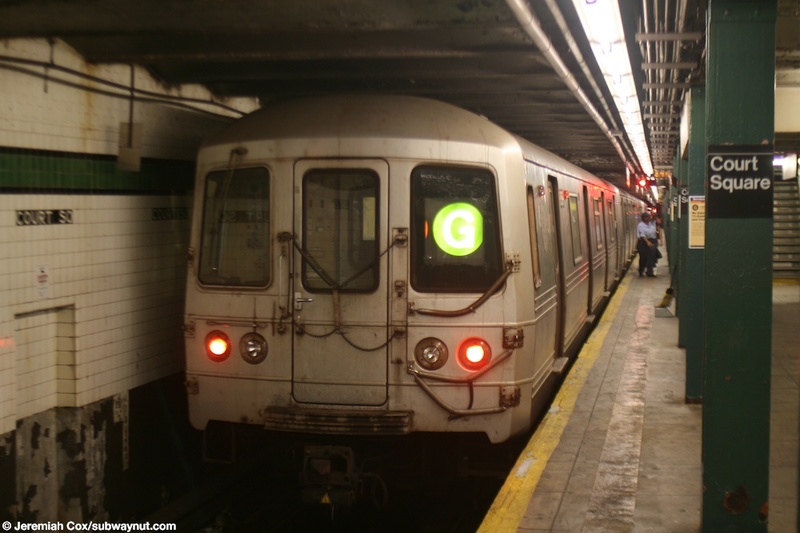 The front of a Smith-9th Sts bound R46 G train stopped at Court Square. 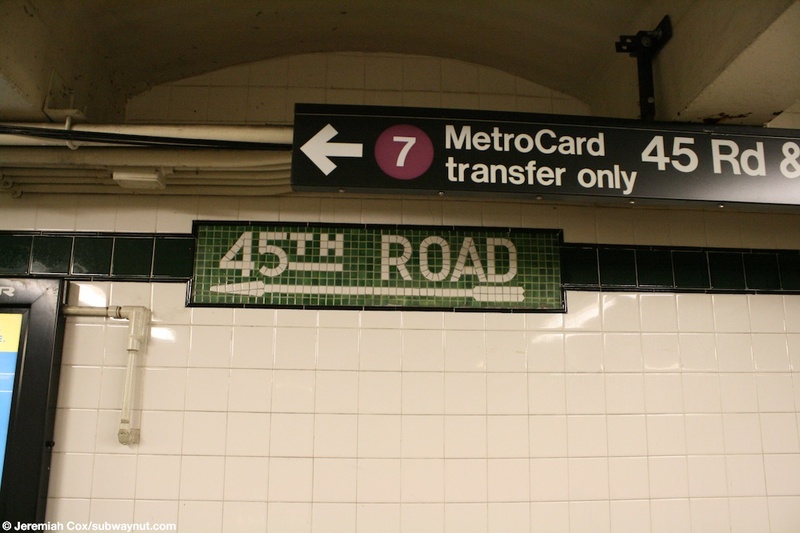 A mosaic in the mezzanine (with its strange blue trim line) for the 45th Road exit at Court Square. Another view down the mezzanine of decent length at Court Square. 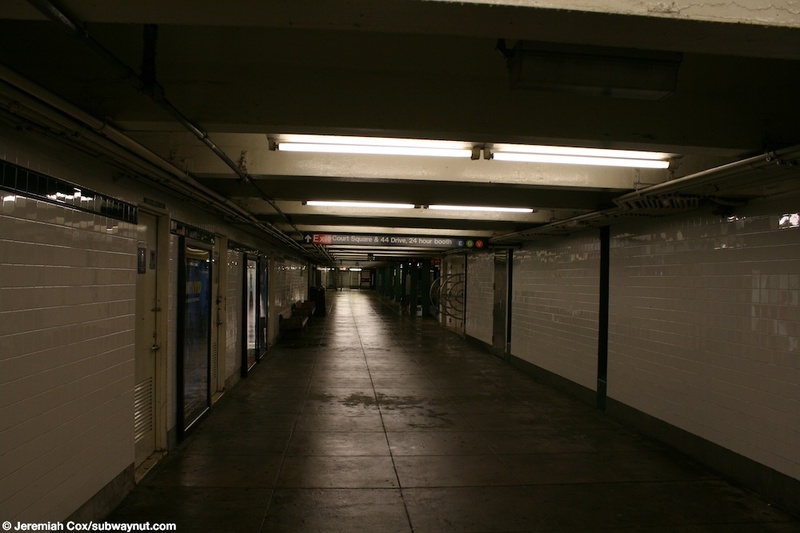 Approaching the passageway that leads of to the E,V at Court Square from the Crosstown Line's mezzanine. 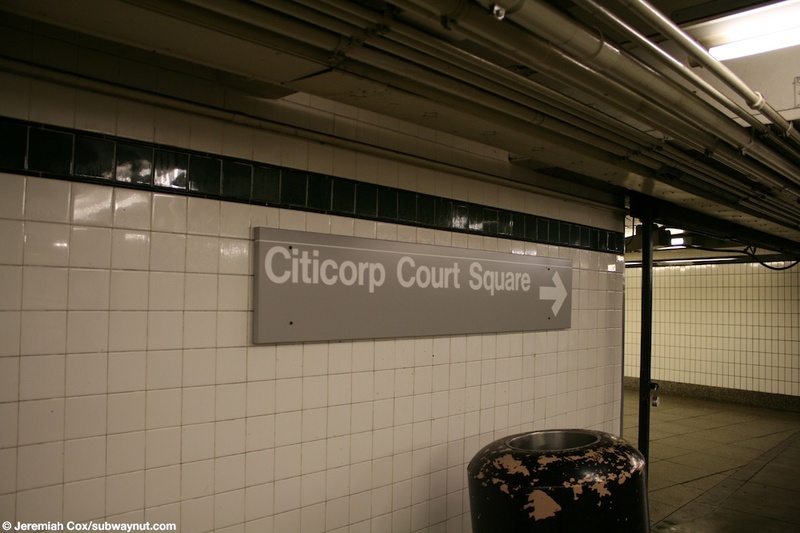 A sign for Citicorp Court Square pointing towards the transfer passageway that Citicorp paid to build. 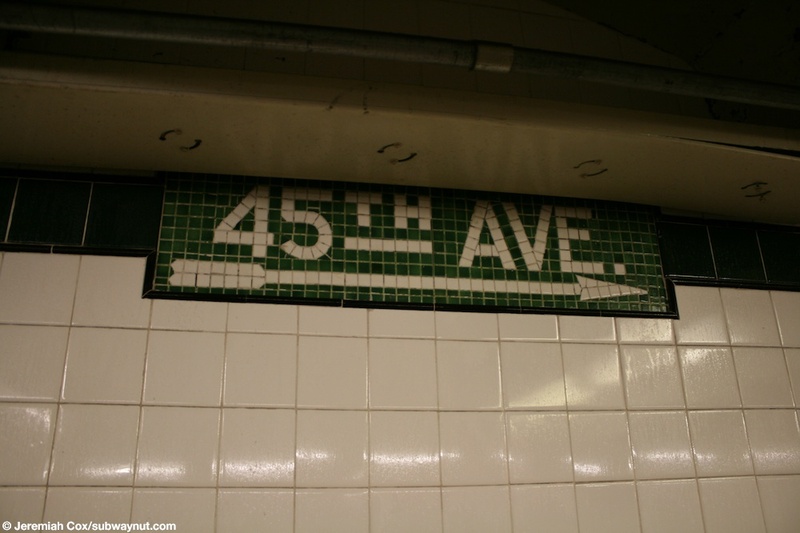 An exit mosaic for the exit to 45th Ave. 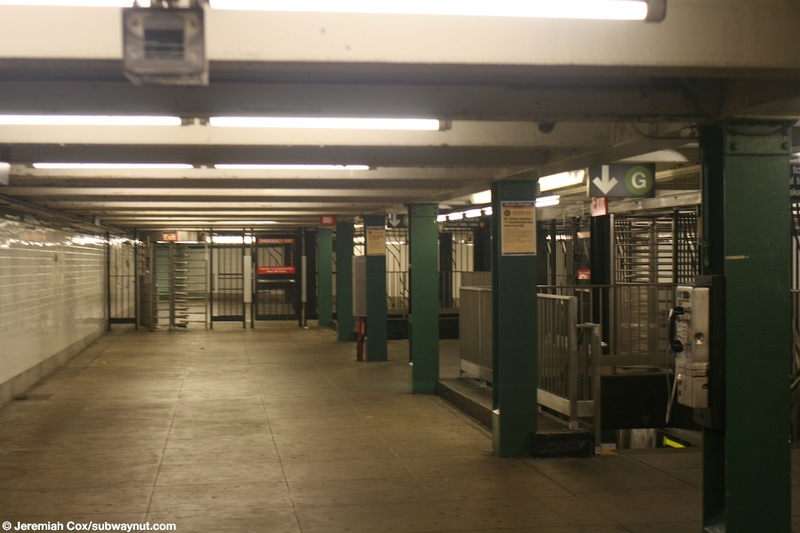 Looking down the G train's mezzanine at Court Square by three staircases down to its island platform. 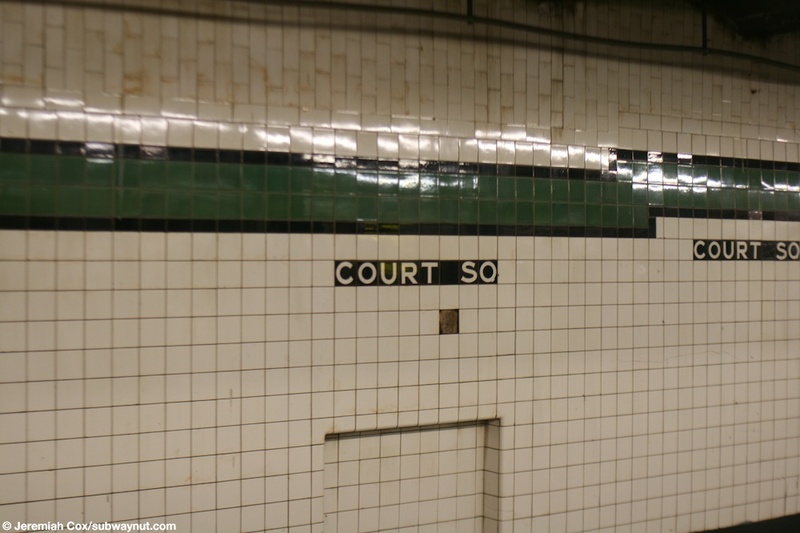 A sign for the exit to Court Sq & Jackson Avenue from the G train's mezzanine. A standard street level entrance to Court Square with the gleaming glass Court Square building complex in the background. Elevator or stairs up to the 7?